A stadium blanket or sports afghan crocheted in your team's colors is just the thing to bring to sporting events to pad hard stadium seats or keep you toasty on a chilly evening. And since you've made it yourself, it's almost guaranteed that no one will have one exactly like it. Select two or more colors of yarn in your team's colors. Select a worsted weight yarn; acrylic is machine washable and dryable and holds well to abuse, but some machine washable and dryable wools are available, too. A larger hook, such as size I/5.5 mm, is an appropriate choice for worsted weight yarn, though other sizes work too. The larger your hook, the more drape your finished blanket will have. For a stiffer blanket, go down a hook size or two. Slip knot your yarn to the hook. Chain as many stitches as you wish; the number of chain stitches determines the length of your blanket. Insert your hook into the second chain stitch from it. Do not count the loop on your hook as a stitch. 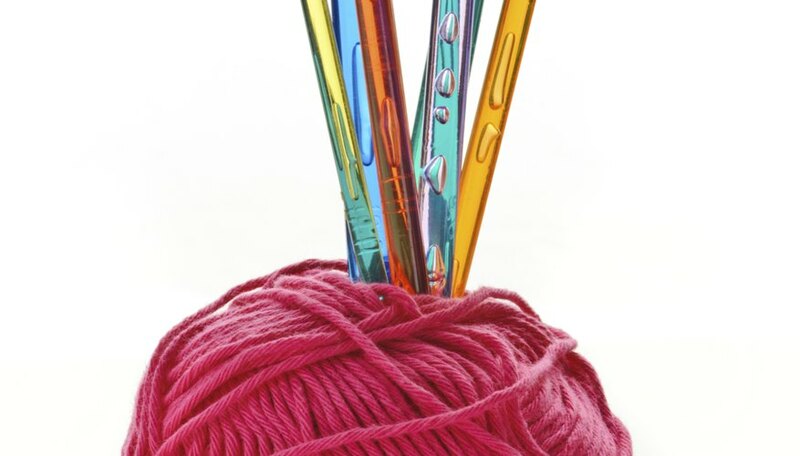 Wrap the yarn around the hook and pull it through to create a stitch known as the single crochet. Work one single crochet stitch in each chain stitch across until you reach the end of the row. Chain one more stitch and turn your work; simply flip it over and start working back the other way. The turning chain keeps your stitch count even. Work a turning chain after every row and before turning your work. Work each row in single crochet, making sure you maintain the same stitch count on each subsequent row. Switch colors by stopping at the last stitch of a row. Insert your hook into the last stitch, as you would normally. Cut the yarn, leaving a tail 6 inches or longer. Pick up the second color and pull it through the two loops on the hook. Create the turning chain in the new yarn color and work as normal. Change colors at the end of a row when you want to create a stripe. For uniform stripes, change the color at the end of every second, fourth or sixth row. For uneven stripes, work until you're bored with a color and then switch. Switch colors only at the end of the even-numbered rows to keep all the tails on the same side of the blanket. Work until your afghan measures the length you'd like. A good rule of thumb for a usable blanket is to make sure it's as long -- or longer -- than the user is tall. So if you're 6 feet tall, make the blanket 6 feet long. A lap blanket, which is easier to tote along to games, can be worked to just long enough to reach from your waist to your ankles. Work to the last stitch of the row, and cut the yarn, leaving a 6-inch tail. Draw the tail through the last loop on your hook and remove the hook, drawing the yarn tight to finish off the afghan. Weave in the yarn tails to secure them and to ensure they don't come loose during washing. Advanced crocheters can make sports afghans with their team's logos or other appropriate motifs using a technique called intarsia. This involves finding a chart with your team's logo on it and stitching it into the afghan using several different bobbins of various colors of yarn. If you aren't quite ready to tackle intarsia, but want your team's logo on your blanket, find the chart and use duplicate stitch or cross stitch to sew the motif onto the blanket after it's finished.